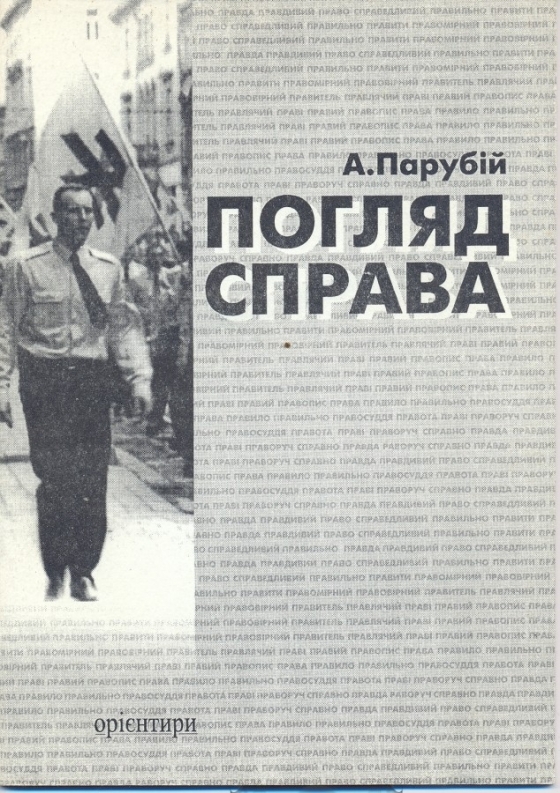 A photo of Parubiy leading the “Patriot of Ukraine” march was placed on the cover of his book, ‘A view from the right‘, published in Lviv in 1999. 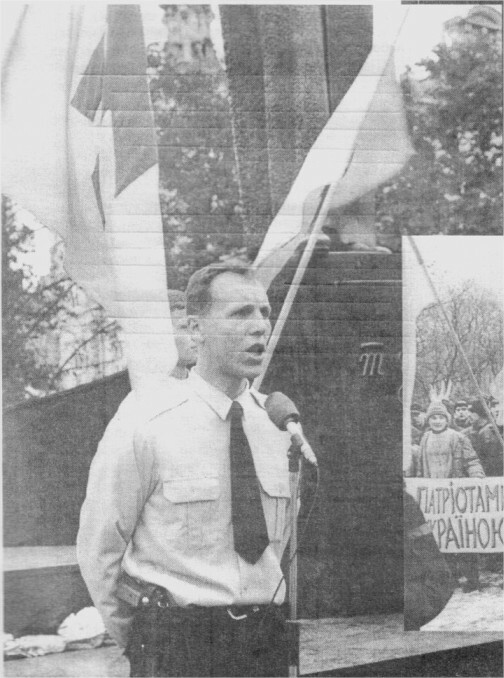 The 2004 change of name and image provoked a split, with Patriot Ukraine, the paramilitary youth wing led by Parubiy, refusing to join the new organisation Svoboda. 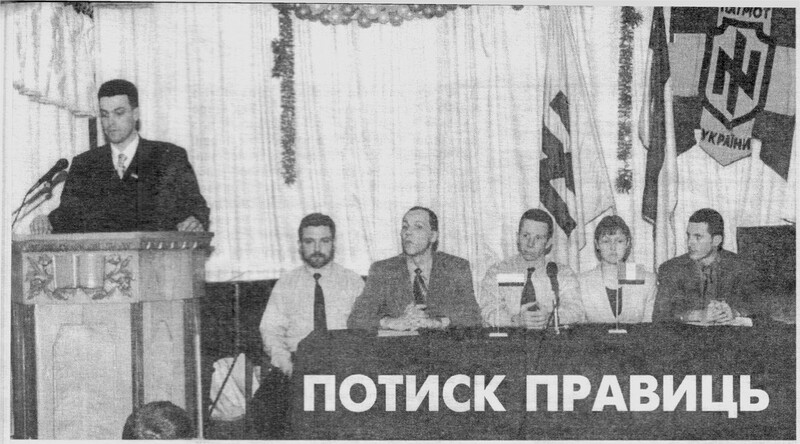 They then continued to exist autonomously and went on to set up the Social-National Assembly, led by Parubiy’s trainee Andriy Biletsky. During the Euromaidan movement, Parubiy was the “commander” of EuroMaidan, and the various Maidan paramilitary units had to take an oath of allegiance to Parubiy. This meant that neo-nazi paramilitary groups which had joined together under the umbrella of Right Sector (Pravyi Sektor) were operating under his authority. 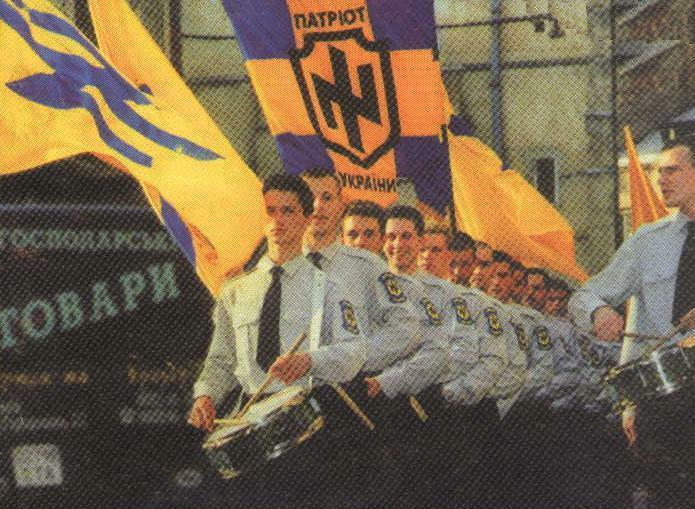 Amongst those was the newly reformed “Patriot of Ukraine”, led now by Andriy Biletskiy, who had been a pupil of Parubiy and went on to become the commander of the infamous Azov Battalion (which has the Wolfsangel as its symbol). The ‘EuroMaidan’ movement overthrow a legitimate government by force and in the overthrow, the armed groups of the Maidan Self-Defence, Right Sector and others, played a crucial role, under the command of Parubiy. His name has also been linked by several sources to the organisation of the Maidan sniper fire which escalated the conflict after an agreement had already been reached. While this cannot be confirmed, the story has been reproduced in the Western and Ukrainian media. After the victory of the Maidan, Parubiy became a prominent figure in the new regime being appointed as Secretary of the National Security and Defence Council a position he occupied until his resignation in August 2014. Some have implicated him in the Odessa massacre of May 2nd, 2014. In a video widely available on the internet, he is seen, on April 29, 2014, delivering military grade bullet proof vests to a unit of the Maidan Self-Defence in Odessa. Receiving the vests is Mykola Volkov, one of the key players in the clashes on May 2nd which left dozens of people dead. 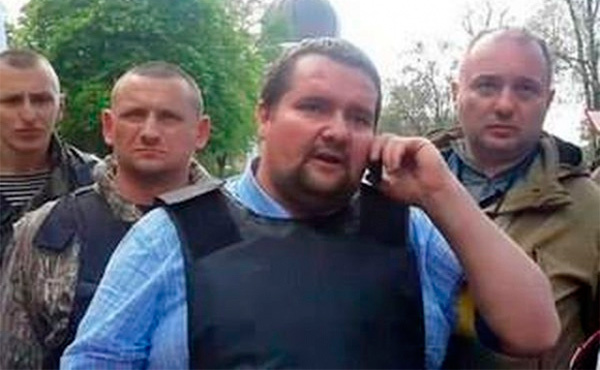 Mykola, who was wearing one of the bullet proof vests on May 2nd, has been identified on the day of the Odessa massacre arguing on the phone with someone in a position of authority that his men should be allowed through police lines to “take care of the rest”, in reference to the clash with anti-Maidan protesters, as shown in this video from EuroMaidanPR. Mykola’s men were allowed through and then burnt down the House of Trade Unions where the anti-Maidan protesters had sought refuge, killing dozens. In another video, Mykola can be seen shooting at anti Maidan protestors trying to flee the burning building by jumping out of windows. While Parubiy’s direct participation in the massacre cannot be confirmed, he delivered bullet proof vests three days earlier is established beyond doubt. The investigations of both the Maidan sniper massacre and the Odessa massacre have been criticised in Ukraine and abroad for their lack of speed and results. In his position as secretary of the NSDC, Parubiy is also responsible for having launched the socalled “Anti Terrorist Operation” in the Donbass as well as incorporating far right paramilitary battalions (the same he commanded in the Maidan movement) into the state apparatus. In 2014, Parubiy became a founding member of the People’s Front party which has a ‘military council’, whose members include Biletskiy, leader of Azov Battalion and Ihor Lapin commander Aidar Battalion. In December 2014, Parubiy was elected first vice speaker of the Verkhovna Rada of Ukraine. The photo shows him being congratulated by the commander of the Aidar Battalion. Parubiy is now due in the UK to speak with government officials and think tanks. Solidarity with Antifascist Resistance will organise a demonstration outside the Ukrainian Cultural Centre in Holland Park where he is due to speak on 23rd October at 7pm. We call on the British government to ban him from entering the UK. This entry was posted in Articles and tagged parubiy, patriot ukraine, snpu. Bookmark the permalink.